Target shoppers were going after doorbuster deals on electronics, particularly the televisions. Home good, including blankets and bed sheets, were also popular. Shoppers turned out in droves at malls and big-box stores around the country to take advantage of Black Friday deals, as retailers opened their doors earlier than ever on Thanksgiving. According to early estimates, the late evening openings are paying off. "Like pumpkin pie and football, Thanksgiving Day shopping is quickly becoming a holiday tradition for millions of Americans," said National Retail Federation President and CEO Matthew Shay. "Steady streams of shoppers have already flooded outlets, malls and other stores throughout the country and shopped online from the convenience of their couch to kick off the holiday season." Toys R Us, Wal-Mart (WMT) and Sears (SHLD) all got a head start on the big shopping weekend by opening at 8 p.m. on Thanksgiving Day. That's even earlier than last year, when the toy retailer kicked things off at 9 p.m. and Wal-Mart, the world's largest retailer, opened at 10 p.m. Sears opened at 4 a.m. last year. "By opening even earlier, the retailers have been able to attract a broader spectrum of consumers to participate in Black Friday -- not everyone is willing to wake up at 4 a.m.," said Marshal Cohen, chief industry analyst at the NPD Group. "They definitely got a lot more business early and upfront." As a result of the early surge in shoppers, Cohen expects total Black Friday sales to be up between 2% and 3% from last year. But by Sunday morning, Cohen anticipates that shopper traffic will fall back to levels typically seen during an October weekend. "There are more hours to shop, but consumers don't have more relatives or more money in their pocket, so once all the dust settles, we won't see too much growth overall," he said. For the entire holiday season, Cohen expects sales will rise between 1% and 2%. NRF, on the other hand, is more optimistic. 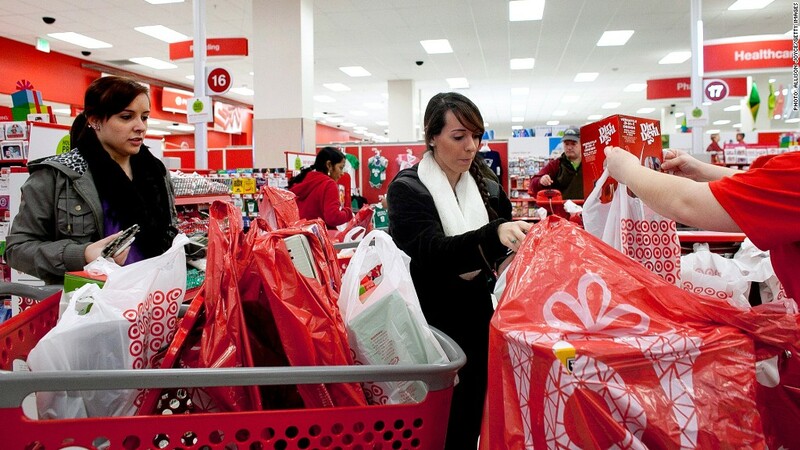 It estimates that holiday sales will increase by 4.1%. 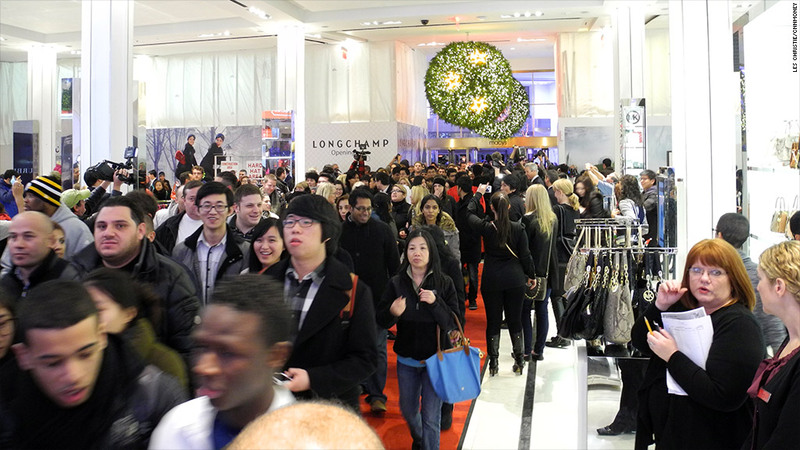 Black Friday traditionally marks the start of the holiday shopping season. Stores consider it to be the most important time of the year because they can make up to 40% of their annual sales in the November-December period. Retailers encouraged by early traffic. Malls were seeing more shoppers than ever before, said Les Morris, spokesman for Simon Property Group (SPG), which operates 160 malls throughout the country. The parking lot at Simon's Cincinnati Premium Outlets in Monroe, Ohio, was full by 10 p.m. Thursday. Meanwhile, store managers at its Jersey Shore Premium Outlets in Tinton Falls, N.J., an area hit hard by Superstorm Sandy, were pleased with the strong traffic, which caused a three-mile backup on the Garden State Parkway. "Many stores including Abercrombie & Fitch (ANF) had to close their store entrances temporarily as they had reached capacity with hundreds of shoppers waiting to enter the stores," said Isabel Rodriguez-Vera, area director of marketing. Crowds kept coming into the afternoon, with malls in Florida, Georgia, Indiana and Massachusetts reporting long lines at checkouts and full parking lots. The crowd at the Toys R Us in New York's Times Square started gathering about four hours ahead of its open, said CEO Jerry Storch. Shoppers were excited for the more than 200 doorbusters and other deals, particularly on items like the Nintendo WiiU and a "buy one, get one for $1" deal on video games. But many had to rearrange their Thanksgiving dinner plans in order to take advantage of them. New York City resident Shay Brown, 25, who spent Thanksgiving with relatives in Pittsburgh, headed to the Wal-Mart in Robinson Township for Black Friday shopping with her family, but wasn't thrilled about the early opening time. "We could have been sitting around enjoying each others' company, but instead we had to rush here to get the deals," said Shay, who was shopping for DVDs. Fellow Wal-Mart shopper Vanessa Moore, 36, however, welcomed the 8 p.m. opening. "I actually like that they're doing it on Thursday, because after you're done eating, there's really nothing to do," said the Steubenville, Ohio, resident. Wal-Mart worker protests: As shoppers stormed the shelves at Wal-Mart stores nationwide, hundreds of people outside -- including some employees -- took part in Black Friday protests. They claim the retailer retaliates against those who speak out for better pay, fair schedules and affordable health care. According to organizers from the union-backed group OUR Walmart, hundreds of workers and thousands of supporters rallied in Landover Hills, Md., Miami, Oakland, Calif., Chicago, Danville, Ky., Dallas and Kenosha, Wis. The organizers say the protests will continue throughout the day. But Wal-Mart said the disruptions were minimal. "We had very safe and successful Black Friday events at our stores across the country," said Wal-Mart CEO Bill Simon in a statement. "Only 26 protests occurred at stores last night, and many of them did not include any Wal-Mart associates." Simon added that less than 50 Wal-Mart workers participated in the protests nationwide, and roughly the same number of associates missed their scheduled shift as last year. The company said it did not experience any walk-offs. Overall, Wal-Mart said this year marked its "best ever Black Friday events," and its stores welcomed a larger crowd of shoppers than last year. During its initial four opening hours on Thanksgiving, the retailer processed nearly 10 million register transactions, and almost 5,000 items per second. The hottest deals: Deals on home furnishings and appliances were particularly popular this year, in addition to sweaters, boots and electronics. At Macy's, Black & Decker waffle makers were among the items to sell out early, said Nick Nicolosi, the general manager at North Point Mall in Alpharetta, Ga. Shoppers also rushed to buy Keurig coffee makers and travel luggage. At Target (TGT), consumers were going after doorbuster deals on electronics, particularly TVs, said spokesman Joshua Thomas. Home goods, including blankets and bed sheets, were also popular. The hottest item at Best Buy (BBY) was a 40-inch Toshiba LCD on sale for $179.99, down almost 60% from its original price. Tablets and smartphones were also big sellers, said Best Buy spokesman Jeff Haydock. Limited Brands (LTD)' Victoria's Secret also invited large crowds. At North Grand Mall in Ames, Iowa, hoodies and yoga pants sold out within five minutes, according to a spokeswoman, and in Lufkin, Texas, the checkout lines stretched to the door even at 2 a.m., two hours after the opening. The manager at the Victoria's Secret store in Town East Mall in Mesquite, Texas, said sales at the location have far surpassed last year. Disney (DIS ) Stores, most of which opened at midnight, were also luring large crowds. Paul Gainer, executive vice president of Global Disney Store, said lines started forming at 11:30 p.m. ET, and overall traffic improved from last year. Disney has been offering the exact same deals to online shoppers throughout the week. Gainer said Disneystore.com is seeing double-digit gains in traffic, and expects that to continue as the online store maintains its "Magic Friday" prices throughout the day and gears up for Cyber Monday. Shoppers also hit other online stores hard on Thanksgiving and Black Friday. Online shopping sales on Thanksgiving Day were up more than 17% from 2011, according to IBM, and Black Friday online sales rose nearly 24% compared to last year. Consumers purchasing online from a mobile device topped 14%. -- CNNMoney's Emily Jane Fox, Annalyn Kurtz, Les Christie and James O'Toole contributed to this article.